French photographer Frédéric Brenner is best known for his masterpiece Diaspora, a 25-year project spanning 40 countries resulting in a stunning visual record of the Jewish Diaspora. In 2007, Mr. Brenner conceived his next project, This Place. He invited eleven world-renowned photographers to join him in exploring Israel as a place and a metaphor using photography as a tool to depict the country as a complex living character. The result is a touring exhibition of thought-provoking photographs, taken without preconceived notions. 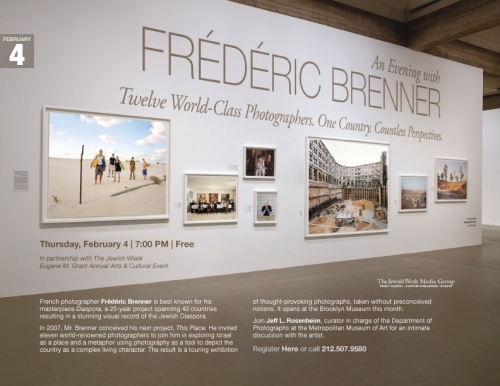 It opens at the Brooklyn Museum this month. Join Jeff L. Rosenheim, curator in charge of the Department of Photographs at the Metropolitan Museum of Art for an intimate discussion with the artist.